Making gingerbread is such a great way to celebrate the holidays. 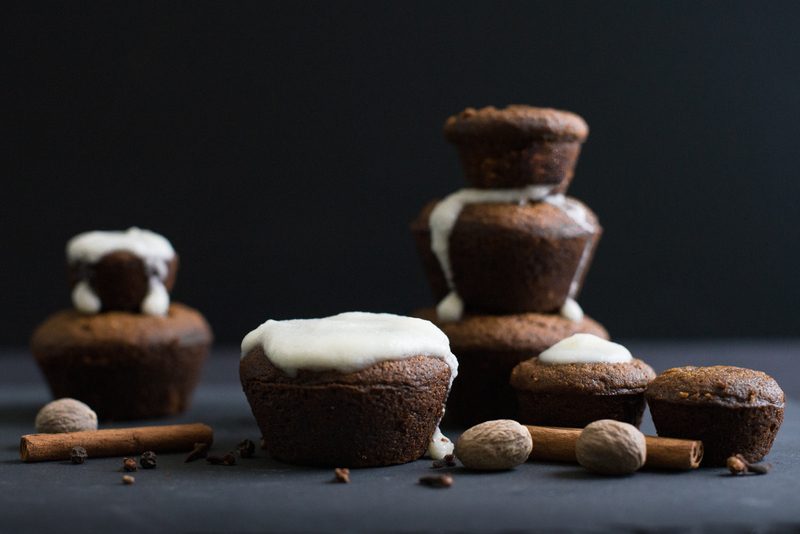 These gingerbread cupcakes are easy to make and will please you little ones, while adding some nutrition to their day. This is a gingerbread cupcake recipe I found online. It was adapted from a Martha Stewart recipe, and I doctored it up a little further. If you don’t have the wheat germ or flax meal, you can always add the same amounts of flour. I find that adding the flax and wheat germ to my baked goods is a nice way to add in some extra vitamins, minerals, fiber and omega 3 fatty acids, without changing the taste. Heat oven to 350 degrees and line about 20 muffin tins with paper baking cups. Boil one cup of water, and combine it with baking soda. Set aside. In a medium-sized bowl, combine flour, flax, wheat germ, ground spices, salt, and baking powder. Set this bowl aside. With an electric mixer cream 0.5 cup butter for 1-2 minutes in a large bowl. Beat in the brown sugar until fluffy, 1 to 2 minutes more. Beat in the molasses, water/baking soda mixture, and flour mixture. Beat in the eggs. Fill the cupcake papers three-quarters full. Bake cupcakes until a toothpick inserted in the center of them comes out clean, about 20-25 minutes. Let cupcakes cool a few minutes, then transfer to a wire rack to cool completely before adding glaze. For the optional glaze, combine confectioner’s sugar and tablespoon of melted butter with a whisk. Continue to whisk while drizzling in milk until you get the consistency you like. When cupcakes are done, drizzle glaze on top or tip cupcakes upside down to coat the tops (as seen in picture).